This may be a difficult sell…. Cauliflower is not everyone’s first choice as a vegetable, let alone as a soup. This recipe is in my new book, Healthy Eating for Life, and we had it for supper tonight–we liked it. “Cauliflower soup,” I replied, somewhat sheepishly. Somehow cauliflower is not a vegetable that’s easy to own! 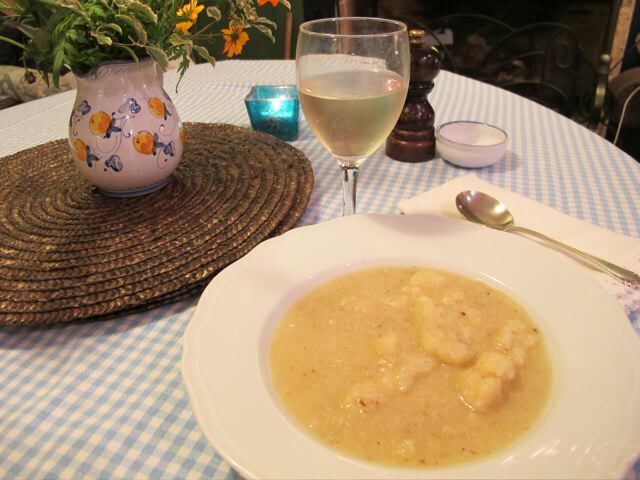 This recipe is adapted from one by Nigel Slater. The key ingredient is smoky bacon. 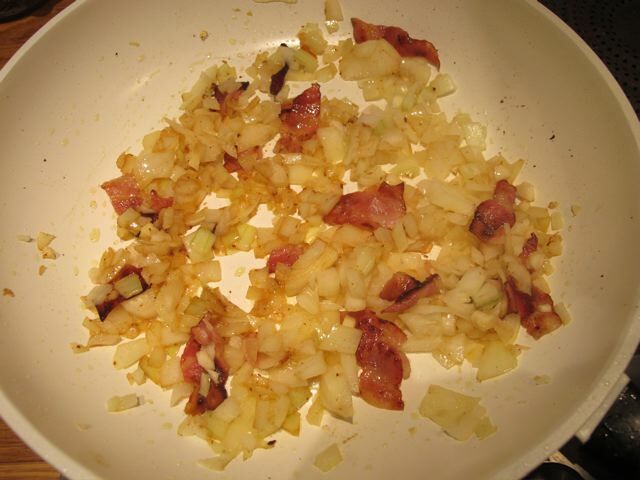 Gently heat the oil in a pan and sauté the bacon bits until they colour a bit. Cook the mix on for five minutes until the onion has softened. While this happens break up the cauliflower into florets and add to a large saucepan. 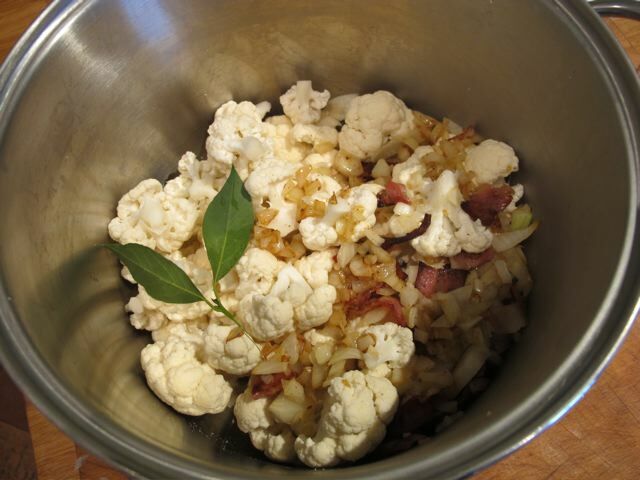 When ready add the onion and bacon mix to the cauliflower pan with the bay leaves and the stock. Cover and bring this mix up to the simmer and cook until the cauliflower is tender. Liquidise the contents of the pan and test the seasoning. Use the set-aside florets to garnish the soup and serve the soup hot. Sounds delicious, can’t wait to make this one. I can’t wait to try this — it seems every one of your recipes just gets better and better as we go along, Robin. We are huge cauliflower fans, raw, cooked, matters not. I have a great recipe for roasted garlic cauliflower chips which get so crispy they are great to snack on. We also love mashed cauliflower instead of potatoes. This soup is on my weekend menu for sure! I’m up for this one. The first thing I notice is the absence of cheese, milk or cream from the list of ingredients. Could it be that I’ve never really experienced real cauliflower soup before? I’m actually looking forward to it. I know you said smokey bacon is the key but is it all right to use turkey bacon? It was great seeing you in Philadelphia–a very enjoyable afternoon in a dreary winter. Try it and let us all know, Debbie. 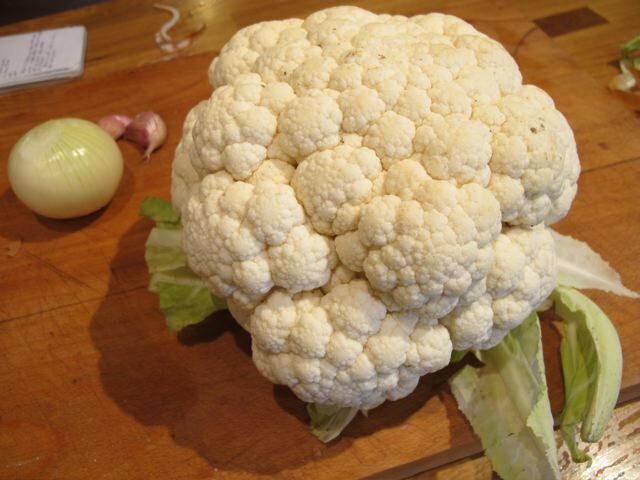 My favourite vegetable is cauliflower and this looks really delicious. Thank you! What would you think “smoky bacon” might be in the U.S.? My husband and I dined out Friday evening and both were surprised to see cauliflower soup on the menu. It was delicious, and we both thought it likely we could find it in your cookbook Healthy Eating for Life….and just like that, here it is. When I saw this blog, I was so pleased and thought, PERFECT!. Although, I do have one question… How would one “liquidise the content of the pan?” I am not familiar with that term? You could use a blender or an electric hand held mixer. I have an electric utensil that you place into the saucepan and it mashes everything up to whatever level of “liquid” you wish. I like the electric utensil that can be placed into the saucepan idea, as opposed to the hand held mixer or blender. I will look for one. Thanks! Emeril lagasse calls that his “boat motor”. :-). We have one, perfect for soups! I am surprised at your apology for Cauliflower. I love it! So versatile and you can add almost anything to it for variety. My favourite is adding a cheesy white sauce, chives and tuna. Cauliflower is in my top three veggies. I love it! I cannot understand why cauliflower is not more popular. I love it! Will definitely try out this recipe. Mulling on why poor old cauliflower tends to have a bad press, I think that it is likely that over-cooked cauliflower has given too many people a bad impression. It is definitely a vegetable to cook at home to get it at its best and not one to eat in a canteen or even a restaurant unless you are eating it raw.or in a soup. I’d happily eat cauliflower every day when it is cooked right but even though it is my favourite vegetable, I cannot bear over-cooked cauliflower. Thank you Robin for being a cauliflower champion. By the way I just love your lemon and paprika cauliflower recipe. Heaven! I’m convinced that people’s aversion to many vegetables is because they were asked to put up with overcooked/undercooked veg from an early age. The answer may be a pair of tongs/pincers to fish a piece out and test it. Robin your cauliflower soup sounds wonderful!!! 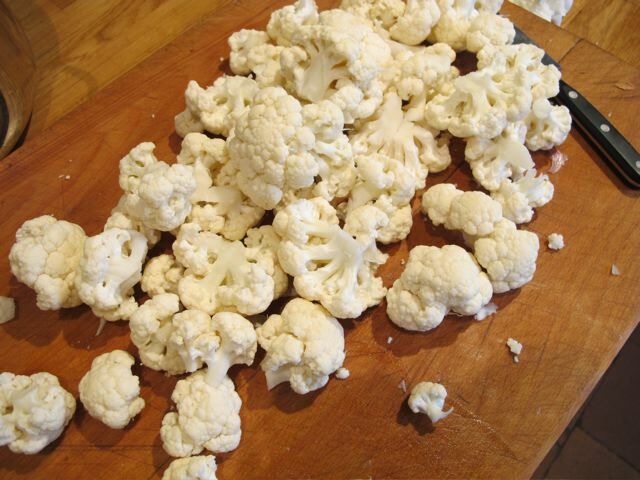 I love cauliflower, I’m going to make some…… Thanks. Some years ago, I was travelling from Paris to somewhere (can’t remember where) by train. A family of mum and two children were near me. Once they were settled, the mum took out an enormous bag of raw cauliflower and all three munched and crunched their way through the journey. Just raw cauli! Now, I enjoy the vegetable in many forms, but not sure about so much plain raw cauli on its own. The soup looks delicious – I shall try it. Do you get Romanescu in France? It is so beautiful and has a really creamy texture. sorry Robin fingers not going where they should I should have said food of the gods .Though I think you are right about veg being over cooked, that mush we use to get at school dinners, put you off things for live. I them with just a bit of crunch in them. “Fake mashed potatoes” so tasty. Oh and your soup was AMAZING!!!!! Thx! That is interesting–I have thought to make it veggy by using smoked paprika instead. Never tried it–thanks. Love cauliflower! Vegan husband means no bacon must explore different seasoning options…red hot peppers 4 sure. Try a teaspoon of sweet smoked paprika. BBC 1 Saturday Kitchen this morning, couscous made from cauliflower! Henry Dimbleby’s recipe. Just had it for a pre-match lunch: delicious. Robin, I looooved this soup. After having two helpings for supper tonight, before retiring, I decided I wanted more. I didn’t even bother to warm it up. I just poured it out straight from the ‘fridge. Even cold, that soup just exudes smooth-velvety-bacony goodness. Well done! We love it too Chris–and not a drop of cream or cheese in sight! I’m not a great fan of smoked bacon so hesitated about making this but took the plunge last week and it’s delicious – I used a hand-held blender which was dead easy now that I’ve mastered using it without getting soup all over the kitchen and so much easier to wash up! Had some more for lunch today and there are three more 2-portion helpings in the freezer (it was such a big cauliflower that we also had cauliflower cheese for supper the other night). I’ll definitely do it again. Delighted to hear that, Sara! We love it too. Just made It for lunch. Took approximately 15 minutes to make. Utterly delicious – I mustn’t be a hog about it. The smoked bacon really nails it. Robin: would you suggest this as a winter or summer dish? (I get confused about this.) Also, if it is a first course, could you suggest a second course? A dinner party coming up this weekend! I found that adding a little dry sherry to the soup also notches it up a bit. I learned about putting sherry into almost any dish from Marjorie Kinnan Rawlings’ wonderful old cookbook “Cross Creek Cookery.” It’s now available in a nice paperback. I didn’t have any bacon in the house, so I used ham stock in lieu of 75% of the chicken stock. The result was good – but with a stronger ham flavour than with just using bacon. I think I’ll try this again but with only 50% ham stock or maybe 33% ham stock. Well Chris–the signature taste is lent by the smokiness of the bacon. You could try smoked sweet paprika.